Original Bill of Rights, First 10 Amendments to US Constitution – 1791: When the first Congress met in New York in 1789, most members voted to include a bill of rights because they promised the people they would. Even though James Madison was against it, he helped guide the amendments through Congress. On December 15, 1791, ten out of twelve proposed amendments were ratified. The Bill of Rights is still the first ten amendments to the U.S. Constitution today. Also, the District of Columbia was established in 1791. And the Second Amendment Ratified was which states, “A well regulated Militia, being necessary to the security of a free State, the right of the people to keep and bear Arms, shall not be infringed.” See U.S. Constitution. In February 1791, the First Bank of the United States (1791-1811) received a unique national charter for twenty years. Alexander Hamilton’s brainchild, a semi-public national bank, was a crucial component in the building of the early U.S. economy. The Bank prospered for twenty years and performed traditional banking functions in exemplary fashion. With the main office in Philadelphia and eight branches nationwide to serve its customers, the Bank’s influence stretched along the entire Atlantic seaboard from Boston to Charleston and Savannah and westward along the Gulf Coast to New Orleans. The First Bank of the United States was needed because the government had a debt from the Revolutionary War, and each state had a different form of currency. It was built while Philadelphia was still the nation’s capital. Alexander Hamilton conceived of the bank to handle the colossal war debt – and to create a standard form of currency. On 4th March President Washington calls the U.S. Senate into its 1st special session and Vermont was admitted as a 14th state (1st addition to the 13 colonies). On 3rd September French Constitution was passed by French National Assembly. On 13th September France’s King Louis XVI accepts the constitution. 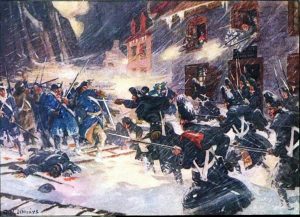 On September 17, 1791, Maj. Gen. Arthur St. Clair headed north from what is now Cincinnati, Ohio to establish a fort at the head of the Maumee River. Had he been successful, folks in Fort Wayne, Indiana would have celebrated their bicentennial three years earlier and presumably it would have been in Fort St. Clair, not Fort Wayne. On 1st October, the first session of new French legislative assembly was held. On 12th December Bank of U.S. Opens. On 15th December 1st U.S. law school established at the University of Pennsylvania. On 17th December New York City traffic regulation creates 1st 1-way street.